Hi there! I'm Yasuhiro and both of my parents are Japanese, but I went to an international school in Japan and have lived in Bahrain, Greece, the US, and France. I speak Japanese, English, and French. I personally find it frustrating when I go abroad and cannot get to know local people (which for me is what local culture is), so that is what I would like to offer: for you to not only go see the popular places in Tokyo, but to meet Japanese people (including myself) and actually "experience" the vibrant Japanese culture of today. I am a huge foodie, so if you like good food, and would like to go to places that are not on guide books, and where you will not find an English, menu, let me know, and I will take you to place with some amazing Japanese food! Spend an Exciting Night Out in Tokyo! 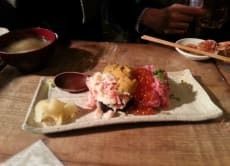 From the initial contact with Yasu to the meal itself, our expectations were exceeded every step of the way. Yasu asked insightful questions to make a restaurant recommendation tailored to our interests. He made our reservation, and also pre-ordered a delicious series of courses for us based on our preferences. When we arrived at the restaurant, everything went smoothly and the food was incredible. Because of this service, we were able to enjoy a truly memorable meal at a fantastic restaurant we never would have discovered otherwise (and probably would have been too intimidated to try). 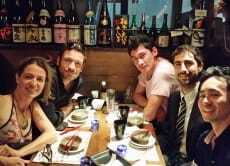 Thank you, Yasu, for making our first dinner out in Tokyo so special. I highly recommend this experience to other travelers. Excellent taste in cuisine. Offered a very detailed and thorough experience. Would highly recommend. Satoko, the guide Voyagin put me in touch with was unable to do the time I requested but made the effort to ask Hisako to do this instead, even meeting me at the station to take me there personally. I was made very welcome at Hisako's apartment and she was a great teacher with a very well prepared lesson in making sushi. After the lesson we sat and ate together. Hisako is a very kind and interesting person to talk to about Japanese culture and I felt very priveleged to be welcomed into someone's home for such a personal insight. Yasu was just awesome, friendly, and knows all the good places to get awesome food!! Really had a great time, good food good people!!! I had a great time with Yasuhiro and his friend. We went to this great yakitori restaurant in Roppongi. The food was really good and I got a chanse to see the "inside" of Japan by going to a place where touristst usually cant go, and also by talking to people who are japanese and live in Japan. This is a great way to experience parts of Japan that are not easy to find on your own and I would recomend it for everyone interested in japanese food and japanese society.